The Antique Center center of Red Bank is open seven (7) days a week from 11:00am to 5:00pm (opening Sundays at 12:00 noon). We are located less than a half mile from the shoreline and in the heart of the historical district which includes many fine restaurants and cafes nearby. Red Bank is a worthwile day trip or weekend excursion for discovering and finding that special something. We offer air conditioned comfort in the summer months while you enjoy hunting through the unique glassware, china, furniture, silver, pottery, jewelry, collectibles and other hard to find objects. Antique Center of Red Bank. We pride ourselves as a family of dealers dedicated to providing those hard to find treasures, collectibles, jewelry and furnishings. The Red Bank Antique Center has been the destination for designers, collectors, movie & stage designers and dealers for over 40 years. The center was started in 1964 by the Johnson family as a permanent antique show with 12 dealers. Today it has grown to over 100 dealers in two building in the heart of the Red Bank Historical District located 1/2 mile from the shoreline of the Navesink River. 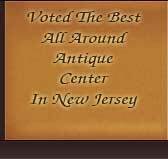 Operated by Guy Johnson, we have grown to be the largest antique district in New Jersey. Housed in two enormous buildings, this is the place to be if you want that certain something that's not to be found in ordinary stores. In fact, you would have to go to garage sales and antique shows from sun up to sun down for years before you could begin to have the same sort of selection that you will find at the Red Bank Antique Center. 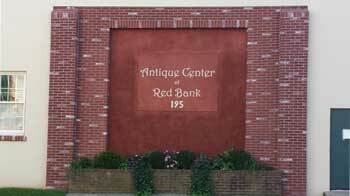 You're invited to come help RED BANK ANTIQUE CENTER celebrate 54 years in business. Guy Johnson's mother Nan started the business here in 1964 and advertised it as "a permanent Antique Show". Half a century has passed and though the dealers have come and gone, and the local landscape has changed, we are still here. We are open 7 days a week with almost 100 dealers in 2 buildings with new merchandise arriving daily. We have something for everyone. Furniture, sterling, art, jewelry, lamps, art, pottery, clocks, glass, linens, mid century and collectibles. We also offer jewelry repair & design, clock repair, toy & doll repair, lamp rewiring, furniture repair & refinishing, furniture upholstery and professional appraisals. Please come join us on Saturday November 17, 2018 for refreshments as we celebrate our long history.